Description: CSX train D802-31 heads towards the J.H. Campbell power plant in West Olive, MI behind BNSF 4076 and BNSF 9476. Description: Extra 20G with an ex-Con widecab and a pair of BNSF pumpkin units trailing. Notice the black door on the lead unit. Description: Trailing as a DPU on a westbound manifest. Description: More Dash-9s take a grain load up the hill towards the Missouri River Bridge. Description: BNSF 4076 sits in the Lincoln Diesel Facility waiting wheel work. Description: BNSF Lincoln Diesel Facility. Description: Three BNSF GE's leads an empty earthworm train north outta TRRA's Madison Illinois yard. Description: A BNSF grain empty heads north out of Galesburg, IL en route to Rugby, ND. 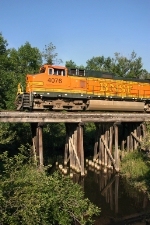 Description: BNSF 4076 screams into Old Monroe, Mo. with the DIL-TCY ethanol train on the BNSF Hannibal Sub. Description: Three units lead a westbound (southbound by compass) oil train through Louisiana MO and over Noix Creek in November 2013. Title: BNSF 4076 Rolls a SB through the small town of Calrksville Mo. Description: An old and new General Electric locomotive lead an empty grain train through Downtown Fort Worth. Description: A newer SD70ACe wearing the latest BNSF H3 paint leads an older C44-9W in H2 paint on an empty coal train moving towards Saginaw Interlocker. Description: CSX 134,BNSF4076,5347,5823,CP 8802 north bound at Buckeye Rd. Description: Two sets of empty EB coal trains fill up at the fuel pad. 9706 lead the set of lite power. Description: Believe this is either a KCK-PAS or a KCK-SPO with the Boeing cars, westbound on the Sand Hills sub near Lakeside.